As you can see by the photo I am on the side of a massive number of Australians who oppose the idea of a Shark cull proposed by the West Australian Government, in answer to deaths and injuries caused by shark attacks in Australian waters. 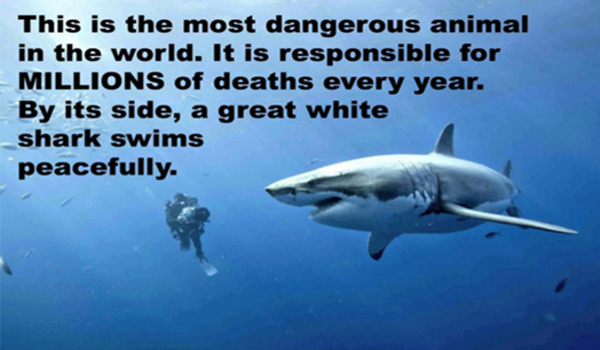 There are 100 fatalities caused by sharks world wide per annum. There have been 219 fatalities caused by sharks in Australia between 1580 and 2013. Not impressed yet? How about these then? There have been 11 fatalities caused by sharks in West Australia since 2000. 1 in every 3 million scuba dives in WA results in a fatality. 350+ drownings in West Australia since 2000. 2600 + road fatalities in WA since 2000. Should the West Australian Government drain the Indian Ocean? No, be sensible – just close all the beaches for Summer – and while they are doing that, surely closing all their roads to vehicular traffic would be the safe thing to do? Makes as much sense to me. How about you?